Vermont, 1972. Carole LaPorte has a satisfying, ordinary life. She cares for her children, balances the books for the family's auto shop and laughs when her husband slow dances her across the kitchen floor. Her tragic childhood might have happened to someone else. But now her mind is playing tricks on her. The accounts won't reconcile and the murmuring she hears isn't the television. She ought to seek help, but she's terrified of being locked away in a mental hospital like her mother, Solange. So Carole hides her symptoms, withdraws from her family and unwittingly sets her eleven-year-old daughter Alison on a desperate search for meaning and power: in Tarot cards, in omens from a nearby river and in a mysterious blue glass box belonging to her grandmother. I thought this book was really beautiful and eloquently written and a fine example of how women's fiction can be literary fiction, deep and moving with a great portrayal of mental illness. It did take me several chapters to become engrossed in this novel and to get my bearings regarding who was who. 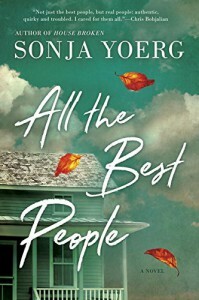 Even then I felt I could have stepped away; however, the characters were intricately developed and crafted with each having their own and I thought of them affectionately. This story has its origins in a real law case and though the rest of it is fictionalised I was impressed by the way that Yoerg set up the effect of the case on the generations to come. Additionally, the setting of Vermont was well done and I felt like this could have been memoir at points. Classism was portrayed in such an incredible manner. I was fascinated by how we saw it slowly creep through the story to play a huge role, and the way that prejudice was so easily dismissed and explained away. The concept of bad blood coming back later through Carole's illness was so incredibly poignant and ironic, and I loved the way the last twist of information worked against those who'd used the idea. The connection between Solange and Alison was honestly so sweet. Alison was an absolute delight to read about and was incredibly well-written; I could see aspects of my twelve-year-old sister in her. The way she talked about feeling lonely and forgotten leading up to how she comes to really appreciate her mother was incredibly touching. Not all characters were 'good' and I appreciated the way this showed all facets of people--the good, the bad, and the ugly. I loved how even when I adored a character, they showed their flaws and did something I wouldn't expect. Finally, and most importantly, I loved how this talked about mental illness. So often literature does no justice to this very important matter, but this showed how mental illness is real, how it needs to be talked about, and how it is something that we can live with. Beautiful, beautiful novel. I highly recommend for those looking for a deeper women's lit read.